Foreign secretary Vijay Gokhale took up the matter with Trump administration during his Washington trip. US has assured of public clarification. New Delhi: The US may soon give a public clarification on Pakistan using F-16 fighter jets and AMRAAM missiles in an “offensive” operation against an Indian military establishment, said government sources. India has alleged that in response to the Indian Air Force (IAF)’s strike at Jaish-e-Mohammed (JeM) camps in Pakistan’s Balakot on 26 February, Islamabad had used F-16 warplanes, made by US defence major Lockheed Martin, to target military installations across the Line of Control a day later. The IAF earlier said that Pakistan also used AMRAAM missiles —manufactured by another American defence conglomerate, Raytheon — that can only be fitted in F-16s. During his visit to the US earlier this week, foreign secretary Vijay Gokhale took up the matter with the Trump administration and received assurances from Washington that the US government will clarify their position on this publicly, said sources. The end-user agreement for Pakistan’s purchase of the F-16 fighter jets stated that Islamabad could only use them for counter-terror operations and not against adversaries. Pakistan has denied that it used F-16s in its operation against India. These military purchases by Pakistan had taken place before the Trump administration– now US is looking to taper down its military aid to Islamabad, sources added. India has also informed US that the actions taken by the Imran Khan government recently in cracking down terror are “simply cosmetic in nature”. At the ground level, situation remains the same. Post the Pulwama attack on 14 February, which killed 40 Indian security personnel, pressure on Pakistan has increased to take action against terrorist organisations based in its soil. Earlier this month, Pakistan said it has put Mumbai terror attack mastermind Hafiz Saeed-led Jamaat-ud-Dawa and its affiliate Falah-e-Insaniat Foundation (FIF) in the list of banned organisations maintained by their National Counter Terrorism Authority (NCTA). 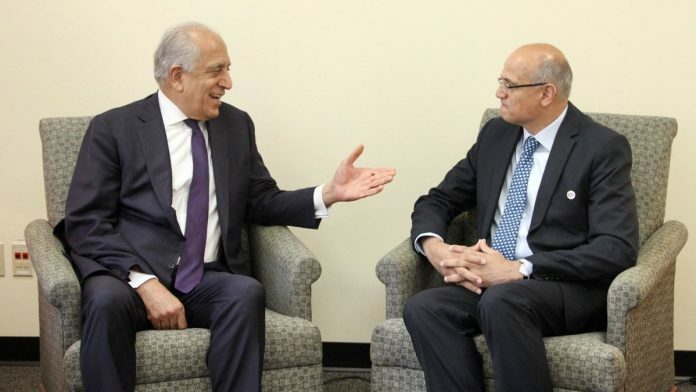 During the last leg of his visit, Gokhale also met US Special Representative for Afghanistan Reconciliation Zalmay Khalilzad in Washington. Sources said both sides discussed the progress being made between US and Taliban on withdrawal of troops from Kabul after an 18-year long war there. Gokhale told Khalilzad that while the talks are on with Taliban for a peaceful settlement, India would like to see the smooth conduct of elections in Afghanistan as scheduled in July, sources said. Sources added that Gokhale also said that no interim government should be put in place.